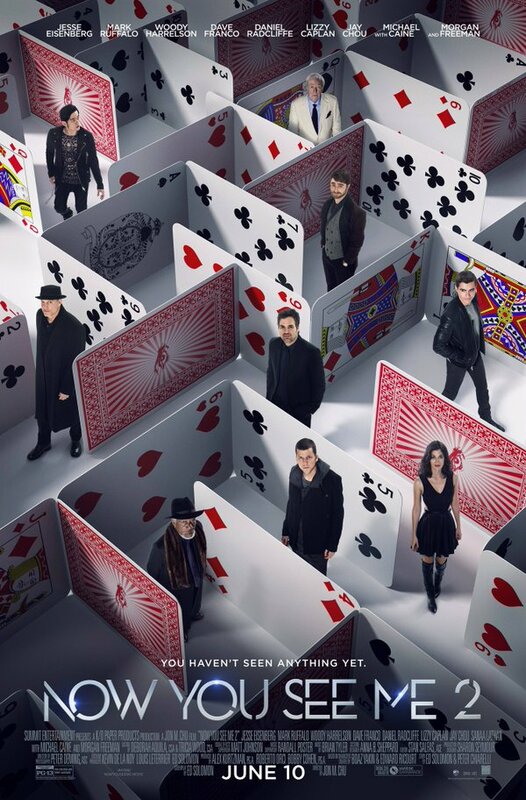 Jon M. Chu’s Now You See Me 2 is the sequel that nobody asked for to a film that –as far as I can tell- nobody loved enough to want to see more. It must have made money otherwise we wouldn’t be here. This time out, the Horsemen are tasked with stealing a computer chip that threatens the privacy of everyone in the world. Apparently four magicians are best placed to be able to pull off such a complex heist. The first film isn’t going to win any points for being clever. It’s a very dumb film but it’s very stylishly dumb which elevated it a lot. I’ll go on record as saying that I enjoyed the first film a lot and I was looking forward to seeing if more of the same could work here. In some ways it does but the experience is a muddled one. The first film ended with a ridiculous twist that Mark Ruffalo’s Dylan Rhodes was living a double life as a representative of a mysterious magic based organisation known only as “The Eye” outside of his role as an FBI Agent. This film rolls with that twist as if it makes sense and tries to expand on it. It does work wonders for Ruffalo’s character who has a lot more to do in this film in terms of character development. His overall history with his father is expanded on and there’s generally much more depth to him. Ruffalo delivers a top level performance as always and elevates some really laughable material. The Horsemen are a really mixed bag. Jesse Eisenberg’s J. Daniel Atlas is massively toned down from the first film and it works really well for him. I find Eisenberg’s over the top performances to be really difficult to watch so it’s good to be reminded that he is a good actor. Dave Franco’s Jack Wilder doesn’t have much to do but Franco delivers an engaging performance anyway. Woody Harrelson Merritt McKinney is the best of the bunch and works best when he dials his personality back. There are a handful of over the top moments that compliment this well but the subtle humour is where he really shines. As a bonus he gets to play his evil twin which brings a lot of entertaining moments. For some reason Isla Fisher chose not to return in this outing and is replaced with Lizzy Caplan’s Lula. She blends into the group well enough and has charisma to burn so the lack of Isla Fisher isn’t really felt. Having this new character into the mix doesn’t support the idea of the Horsemen being hand-picked to hone their skills as a team. It’s clear that a script was written with Isla Fisher’s character in mind and some last minute changes were made to incorporate this new character. The villain of the piece is Daniel Radcliffe’s Walter Mabry and he’s one of the worst villains in recent memory. Radcliffe is absolutely terrible in this role and completely fails to project any level of intelligence or menace in any scene he appears. Some of this has to do with the script not quite knowing what to do with this character but there’s nothing about his performance that works. Admittedly it is pretty clever to have Harry Potter be a non-magical villain in a magic based movie but that’s pretty much the only clever thing about the character. Michael Caine and Morgan Freeman also make small and fairly pointless appearances. In terms of storytelling the film is all over the place. If you’ve seen the first one then the formula here is really similar. There’s a lot of misdirection and implied jeopardy before revealing that it was part of the plan all along. This happens frequently throughout after the Horsemen are initially defeated. It’s clear that there’s an attempt to appeal to an international audience with a globetrotting experience that takes the characters to both China and London so maybe there are plans to cater to a global crowd. If it can make it into China it certainly won’t hurt the box office. There’s an overall sense that the film thinks it’s smarter than it actually is. Many of the reveals are framed as if they have genius level shock value. If you apply any thought to them then they really don’t make sense but I’m pretty sure the film is counting on the audience not thinking too much. In many ways the plot is overly complicated without enough explanation so there’s an overall unfinished quality to the film that comes with half-baked revelations. The ending suggests that there will be another sequel so it’s not over yet. Despite all that, I was really entertained by much of this film. For the most part the cast work well together and the visuals are memorable enough even if the abundance of CGI completely counters the fact that the characters are supposed to be experts in sleight of hand. There’s an opportunity to use some clever practical magic here that isn’t being taken advantage of. This is a lot of fun but very dumb fun; I guess I could call it a guilty pleasure. An entertaining yet really dumb film that assumes it’s smarter than the audience despite delivering some really half-baked reveals. The main cast work really well together but Daniel Radcliffe makes for one of the weakest villains in recent memory. There’s nothing here to challenge the mind and the overuse of CGI ruins the opportunity to show some clever magic tricks but it’s mindlessly entertaining while it lasts.